"...The excitement at seeing the alligators and snakes, the bears and the impalas,the kebu and the anteater and especially the lion and lioness whom they dubbed Nala and Simba was contagious. 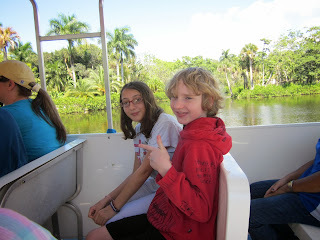 But the highlight of the day was the boat ride around “Lake Victoria” seeing the monkeys, apes and gibbons in their own island habitats, and the lemurs being fed at snack feeding time. 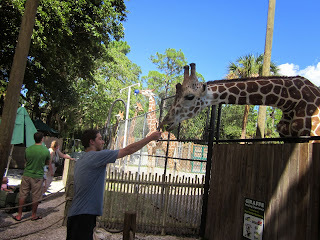 Gaspare and Eric loved feeding the giraffe but Marcella enjoyed watching this from a bit of a distance. The way the giraffes bent down and waved their necks made us think they were singing Happy Birthday to her. The barn owls and the sloth hanging around the neck of its trainer and the Gila Monster whose venom is helping people with Diabetes II and cancer were also highlights of the day. Letting off steam in the playground was another fun time. 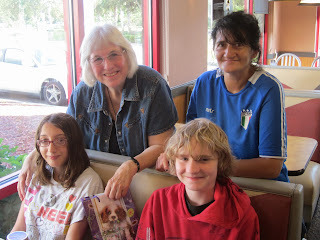 This was such a joyful time with the animals and her friend Eric and her family and pastors, that I think she will remember her twelfth birthday for a long time. that is if she doesn’t get sick from ordering and eating 5 chicken pieces, one carmel shake,curly fries, and one chocolate turnover at Arbys." Good Shepherd Catholic Community, Ft. Myers, Fl. "It’s time to end this shutdown. I’m standing in full view of the Capitol Building with a group of clergy and faith leaders who are here to offer a “Faithful Filibuster” of the government shutdown – and we’re going to keep talking until things change. We know that this shutdown disproportionately affects the most vulnerable in our society. So our words will not be wasted diatribes or placements of blame. Rather, we will use God’s own words – reading the more than 2,000 Bible verses that speak to God’s justice for the poor and vulnerable – until this shutdown ends. And while we recite the verses to bear witness for those suffering, we want to make sure that every single member of Congress can read them too. It is our goal to send each member a copy of the Poverty and Justice Bible, which highlights each of those 2,000 verses. Our elected officials need this reminder now more than ever." "We need your help to make this happen! Will you chip in $25 to sponsor a Bible for a member of Congress? We’ll include your message of why they should pay attention to what God says about justice for the poor and vulnerable. Our nation can have a brighter future for all of its people – a vision that cannot become a reality as long as Congress remains gridlocked on the budget. After these 2,000 verses are read, we’re going to keep talking. We’re going to keep sharing God’s message of good news for the poor to help our elected officials rediscover the vision of the “common good.” We’re going to keep talking whenever Congress is in session until this shutdown ends. I look forward to reading my portion of the 2,000 verses today. I believe in a God of justice who looks out for the poor and vulnerable in our society, and I am eager to stand with fellow faith leaders to share this conviction. Our “Faithful Filibuster” will remind members of Congress that its dysfunction hurts people and that it is biblically imperative that they function to serve the most vulnerable. Will you join us in this work? Our members of Congress will hear this message over and over again in the coming days as we keep faithful vigil over the Capitol and the work within. Accompany us in this work by following #FaithfulFilibuster on social media and offering your own messages, verses, and prayers." Jim Wallis is president of Sojourners. His book, On God's Side: What Religion Forgets and Politics Hasn’t Learned About Serving the Common Good, is now available. Watch the Story of the Common Good HERE. Follow Jim on Twitter @JimWallis. ..."The work continues when Michelle Alexander writes The New Jim Crow ; the War Resisters League and the Friends Committee for National Legislation publish charts showing the enormity of military spending; and shareholders submit resolutions calling for corporate transparency...Where's the "Catholic" in all this? I suspect some of the bishops' complaint against the sisters is exactly that we haven't been "Catholic" enough, and besides, without habits we've been invisible to people we aren't harassing. It might help if bishops campaigned against the use of force by men the way they have campaigned against abortion, a women's issue. But the poor have paid a heavy price for the bishops' siding with the Republicans, and I think Catholics have paid a heavy price too. A final note: The Catholic Worker is thriving. It's not "Catholic" and it's too white, but across the country, men and women in their 20s and 30s are feeding the hungry, protesting war and resisting taxes. Dorothy Day always called the Worker a school. Graduates are pouring out to challenge the system every year." master’s degree in religious studies. 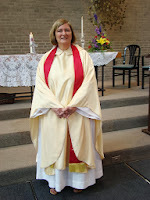 Association of Roman Catholic Women Priests. have been long-standing, Meyers began her higher education with a different goal in mind. in history, initially planning to teach at the high school level. She went on instead to earn a Ph.D in the field. emphasis on sports and that kind of thing,” Meyers said. or withdrawn from his position— Roman Catholic priest. Church in FortThomas and Our Lady of Peace in Cincinnati. and an act she felt sure would serve the community well. Be the MOVE in movement. BE God's living passion for justice, equality and peace. Become a member of an INCLUSIVE Catholic community that welcomes all and promotes the liberation of God's people. Here at Inclusive Catholic Church, we are committed to serving God and the needs of you and your family. We welcome everyone at the Eucharistic table and offer all sacraments to everyone. Wherever you may be on your spiritual path, you will find a supportive community at Inclusive Catholic Church. We aspire to strengthen each person's confidence and joy in Jesus Christ - at every point in their life, and encourage personal and spiritual growth through prayer and active service. Fort Thomas, Kentucky Mass is held the third Tuesday of the month from 7-8pm at Christ Church 15 S. Fort Thomas Ave.
Westside Mass held the first Wednesday of the month from 7-8pm at Our Lady of Peace Church 119 Wocher Ave off of River Rd. in Cincinnati. "We began this day with a prayer for grace. As we prepared to visit Allan, who is fifty-six, in Hospice first, we prayed that we might know how to be there for him. We were told that he would not rise out of this bed. We did not know how we would find him. We have known Allan since the beginning of our Church in the Park ministry in 2007. He was one who dropped in on his own schedule when we were outside and when we moved to Church in the House too in 2009. Tall and artistic he had painted houses and the fumes had taken its toll on his lungs even then, Still it was a struggle to help him get SSI Disability as he hated going to Doctors. (Finally with lawyers he was successful and he was proud to own a little trailer of his own). He is known for his Hawaiian shirts so we brought him one to drape over his bed along with a little bear bearing a heart that said I Love You. Allan was in quiet reverie as his eyes fixed on the TV with a poor and faded picture. He looked up, focused and was so pleased to see us. He loved the bear and gave us a big smile. He liked it even better when we produced the trademark Hawaiian shirt and draped it over him. He began slowly to come alive and was happy to share that his son had come from California to see him and his ex-wife and step daughter were regular visitors along with his best friend, Dan. This meant so much as he has been estranged from his family. 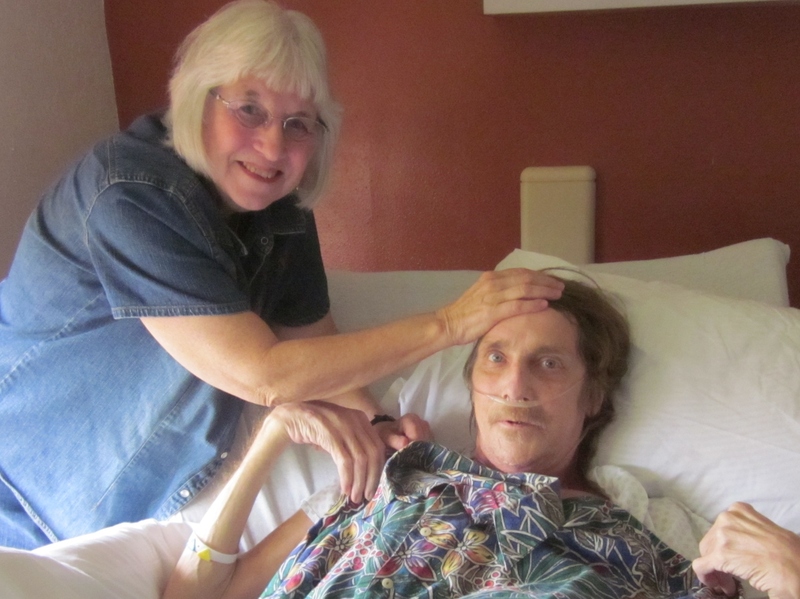 He liked Hospice better than the hospital, and he was feeling comfortable. But, said he was praying to get up and walk again so he could go home. He admitted that it was very painful to get up so he didn’t think it would be soon,maybe “in a while”. In the meantime he was thankful for being comfortable and having people who care about him. He shared that in addition to the COPD, he also had cancer. They “got it” but he was unable to continue with radiation. He became more and more animated as we talked. He even asked us to fix the TV picture so he could actually see it. We did and he was amazed at the brilliant colors. He said that he still loves colors. This is Allan sporting his Hawaiian shirt. 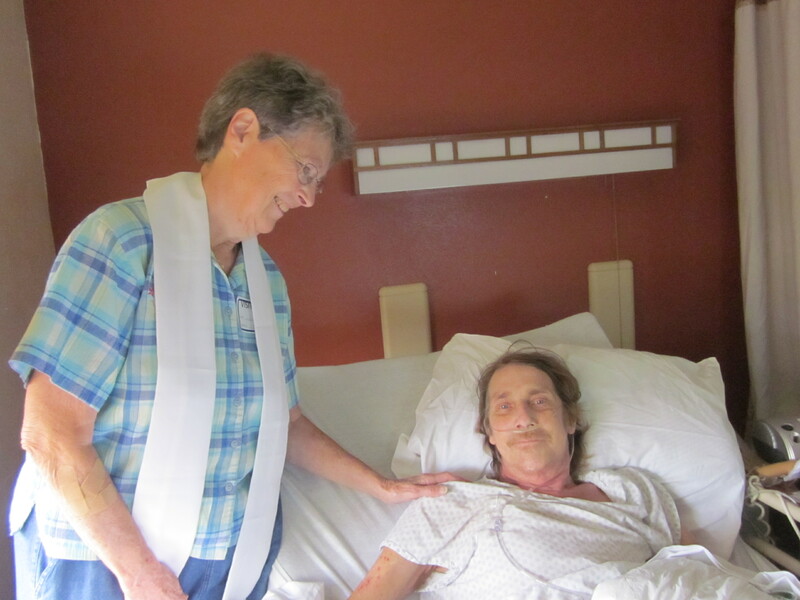 As our last two in hospice Anointings were when death was imminent and last rites were appropriate, we were thankful that Allan was so well able to respond and gain a bit of life and strength from the healing Rite and our time together. We then went to visit Mike who is also fifty-six and has COPD. We knew Mike from the beginning of our ministry with the homeless as well. He had lived in our transitional facility and was housed since 2009. 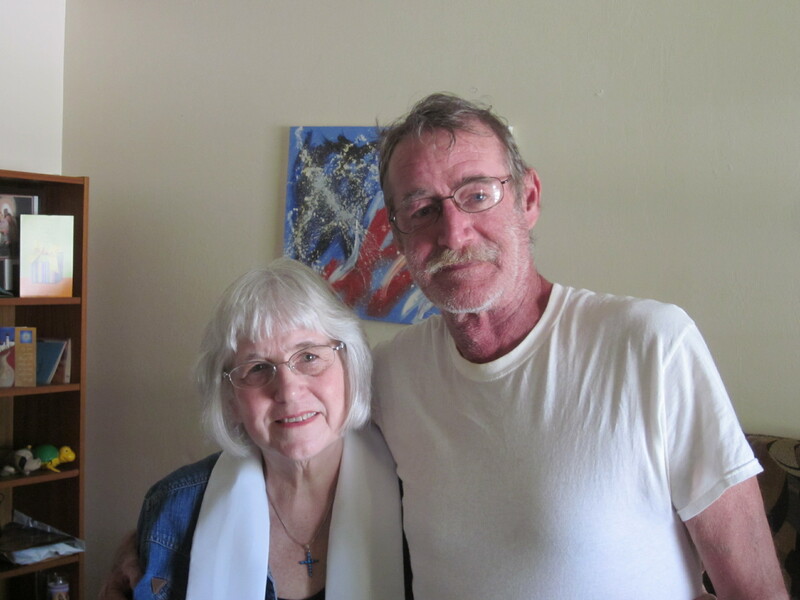 Mike was finally home after three life threatening hospitalizations. We had anointed him at the hospital. We were so glad to see him doing so much better and taking hold of life once again. 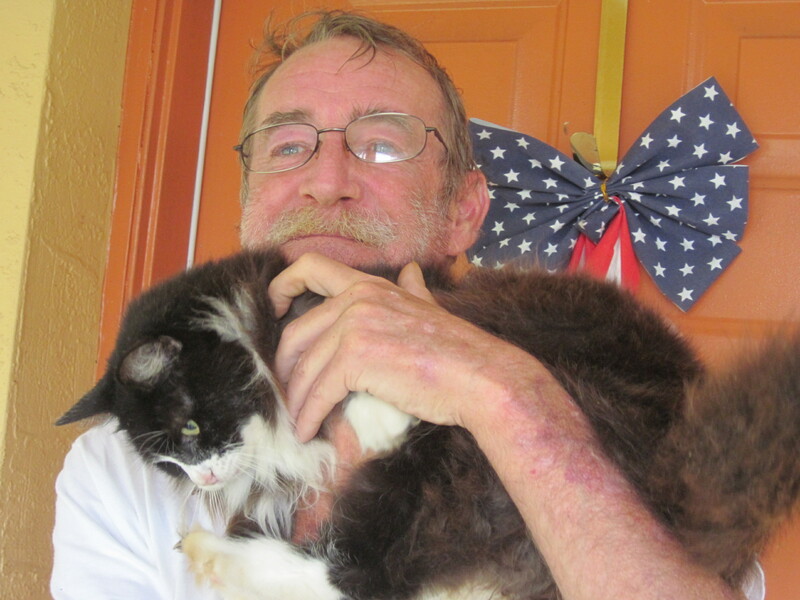 This is Mike and one of his cats. His love for them motivates him. Our gift to Mike was cat food as well as cookies for himself. He is happy to be able to eat again. Mike is presently homebound and this is hard for him as he likes to go to church and he likes talking with people. He shared how much he enjoys visits from his friends who are ‘snowbirds’ and will return soon. We shared his health concerns, his recently successful battle with alcohol,his family joys and concerns, and his worries. We helped him fill out paperwork for rides to the Doctor’s office.We also shared his joys at getting better finally. He was happy to be anointed and participated fully. He likes to pray and was at peace as we left. When we left Michael we met Len at the bus station to buy him a ticket home to another part of Florida. Len has been housed since March 2013 but has recently been struggling with mental health issues that pull him back to the streets. 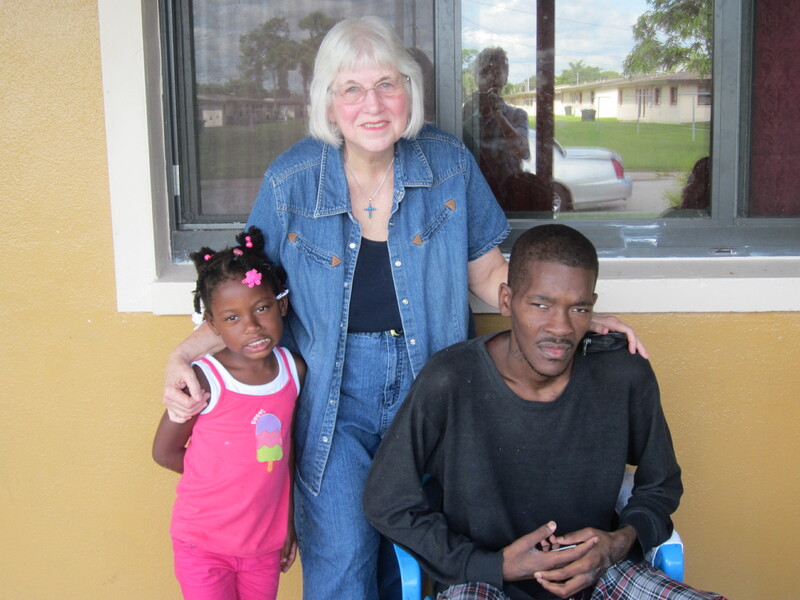 By the grace of God he is now ready to get help for those issues and to return home so he does not lose his housing. He will be going home on his fifty-seventh Birthday. He was thankful for the ticket and for a Birthday card and gifts. Then we went to visit Shawn and his family. Shawn is a young adult, twenty-two years old, that we knew from our pastoral work before we started the Church. There are now sixteen members of his family that now attend our church as he does. We visited him as,due to gum disease, he is going to have all of his teeth pulled tomorrow and he felt frightened and depressed. As he had trouble eating and felt weak, we also brought him an MD prescribed protein shake and blender so he could survive without chewing. He had shared his lowering self esteem because of the removal of his teeth as a major source of depression. We gave him a beautiful new shirt to wear as he felt better and his family told him how handsome he would look in it. This brought the first smiles in days. We prayed with him and promised to be with him throughout this trial. We then enjoyed some play time with his younger cousins who also attend our church. Fortified by the love of this wonderful family, we then visited two more families. We visited Jane and her two adult sons. Jane is an elderly woman who has many painful illnesses. She was feeling better after her new Doctor tried a new medication and she was planning a little vacation. She was nervous about leaving home and shared her hopes and her anxieties. We have known Jane for about thirteen years through our earlier Mission parish work. She was happy to pray with us and asked our blessing on herself and her sons. We ended the day with visiting Roger who was the first man we had prayed with during our street ministry. He has had some troubles lately and was glad to have us visit. He wanted to assure us that he has to miss church sometimes but he is living as Christ wants him to live. He is sharing his goods and gifts with his neighbors and is praying always. We blessed Roger and received his blessing and our day of pastoral visits was ended. Thanks be to God for this day of blessings!" and so concludes that God is in Israel. to make it holy ground. or the temple in Gerazim in Samaria. So he goes back to thank Jesus. These foreigners have it right. anything they have ever thought or experienced before. So they think about it. They look at the reality around them. Then, believing that the experience is real. Thinking about it and trying to understand what it means. These readings today reverberate in our own lives. one of those in need of healing. Syrians and Samaritans and Paul in chains—they’re outsiders. Sunni and Shiite, Israeli and Palestinian—outsiders. blacks and reds and yellows and browns and whites. They are “other,” and we don’t trust them. They have B.O., filthy clothes, scraggly beards. like they’re ready to pounce and rob you. or wash their clothes or take a shower. or touch a doorknob after they do. . But the scriptures teach us what to do with outsiders. and sent him to wash in the healing waters of the Jordan. and sent them to the priests to be certified clean. to act in compassion and kindness. only kindness and caring and concern. And these foreigners, these outsiders, are changed forever. and not just as a healer. in the one who embraces the outsider. of nation and culture and religion. The experience catapults them into faith. They believe in the God who has touched them. Naaman wants to give a gift, but Elisha won’t take it. with the God who has made him whole. and Jesus tells him it’s faith that has saved him. neither in Gerazim in Samaria nor in Jerusalem in Israel. God is in the loving acceptance of another human being. that they had seen in Jesus. What would an outsider have to do to follow Jesus? Would the outsider have to become Jewish? in the way Jesus had shown them. about the deserving poor… and the undeserving poor. because he already gets $350 a month disability check. Or because she spent 18 months in Stryker for prostitution. Or because he’s a transvestite. for one reason or another. who are out there right now. racism still exists in America. There are details about it in today’s bulletin. for someone of a different race, 10 times in October. As a white person, I’m part of the privileged majority here. and I’m going to go out of my way to be kind. Some people won’t want my help and will walk away. Some may even get angry at me, or try to take advantage of me. No doubt I’ll end up helping someone who didn’t need it. I hope to be a better person by the time November rolls around. More sensitive to people who are different from me. Sign Letter to Congress: "There is nothing Christian about taking food from poor"/End the Government Shutdown Now! Stung by the outcry against their pointless political stunt, House Republicans are now desperately trying to reopen the Smithsonian and our national parks. But these politicians, who got elected by calling themselves pro-life Christians, continue to take food out of the mouths of hungry babies, force poor parents to miss work because child care is shut down, and even jeopardize military death benefits for widows and orphans. This time, let's not let them get away with wrapping themselves up in the Bible while ignoring its contents. A diverse group of Christian leaders including Jim Wallis from Sojourners, Sister Simone Campbell of the Nuns on the Bus, and two former U.S. ambassadors to the Vatican just released a powerful statement condemning those perpetuating the shutdown, saying "There is nothing “pro-life” or Christian about taking food away from pregnant women and babies." If we all add our names to their statement, we can make sure it gets seen far and wide — and the members of Congress who call themselves Christians may finally have to start answering for their deeply unchristian behavior. Increase our faith, the disciples ask. A huge, deep-rooted tree pulled up and thrown away. because of fear, fatigue, and pain. lift cars off people pinned under them. They are convinced that the situation is life-threatening. So they act in spite of their fear, fatigue, pain. would allow his disciples to perform extraordinary feats. and called others to follow the Way of Jesus. they called people to pledge allegiance to God above all. they called people to be generous to everyone. and to love their enemies. to uproot a few mulberry trees. that he will lose his position as Speaker of the House. The disciples are following Jesus on the way to Jerusalem. They don’t understand what he’s about. So they ask for an increase of faith. will allow them to do unexpected things—miracles, even. are in right relationship—the right relationship of justice. We see a can thrown in a parking lot and pick it up for recycling. We notice someone with a heavy load and offer to help carry it. We open doors for folks and let them go ahead of us. We respond to requests for food, clothing, shelter. We show up at the school for parents’ night or grandparents’ day. We listen when hurting people need to talk. just turning our world into the kin-dom of God. ",,,The positive reception to Pope Francis from all quarters is itself almost as astounding as the man himself. A kind of global sigh of relief has greeted his humane and kindly manner, a signal that the human family, even in a secular age, longs for a rescue of transcendent value. The Catholic Church, for all of its problems, and if only because of its history as a pillar of Western culture, remains a universal object of fascination. When James Joyce described Catholicism as “here comes everybody,” he forecast the way everybody seems relieved to have such a man at the pinnacle of religious influence...",,,:The church of justice for the poor must be the church of equality for women — inside the church as well as out. There is no other way. Thus, it matters less whether Pope Francis at present favors the ordination of women than that he has already launched a historical process that makes it all but certain. Other reforms will follow. Style influences substance, and attitude influences everything..."
James Carroll is right. 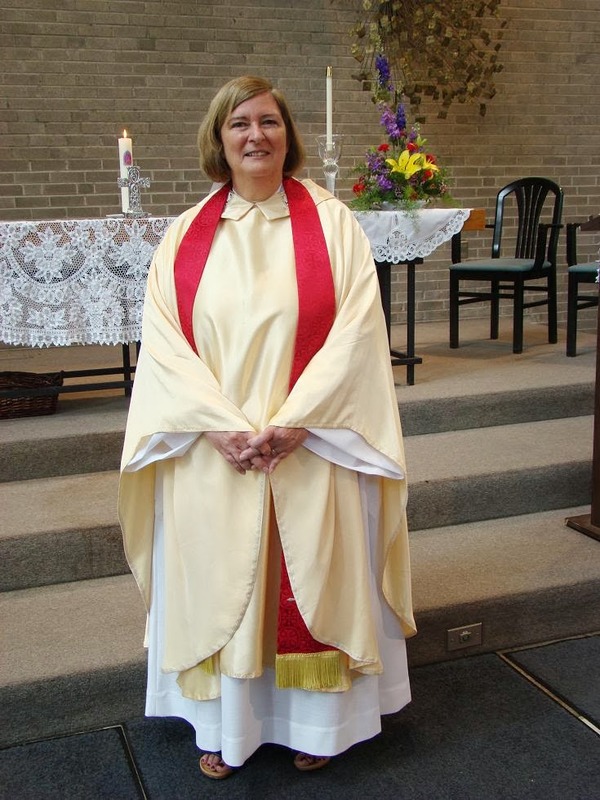 This is why the Roman Catholic Women Priests Movement is a "holy shakeup." Justice for the poor and justice for women in the church is constitutive to the Gospel today. We are leading the church into its future by living Gospel equality now.